Welcome back, dolls! 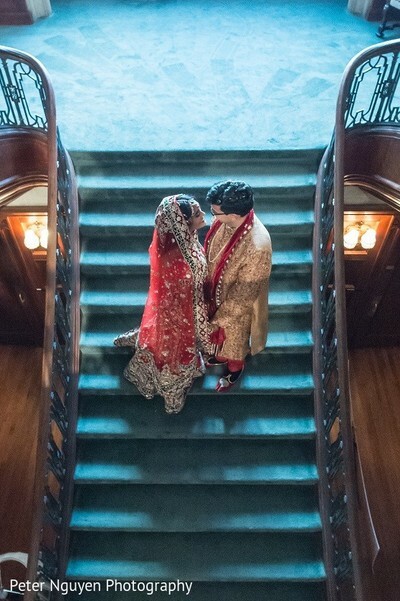 We're spending the rest of the day reveling in one of Peter Nguyen Photography's beautifully photographed shaadis in Atlanta, Georgia — and this Indian wedding is going to sweep you off of your feet! 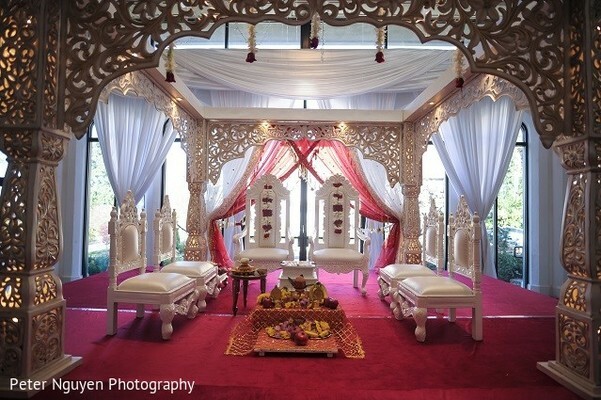 We're at the Callanwolde Fine Arts Center, where Desi dream couple, Surpiya and Raj, are getting ready to tie the knot, and the decor experts from Sterling Decor have delivered a stunning setting for them to say I do in. 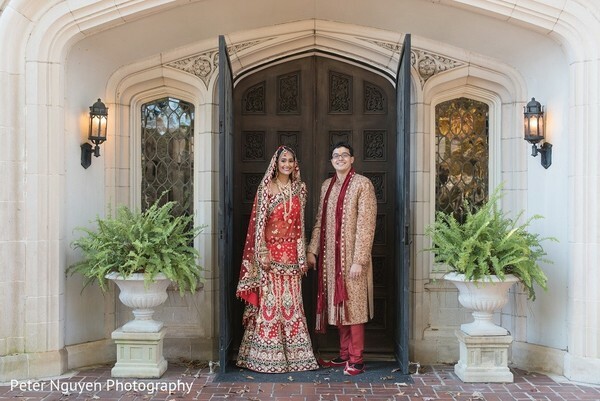 The Indian bride of the hour is exquisite in her traditional red wedding lengha, and we can't get enough of these first look portraits of her and her Prince Charming. Amelie Artistry fabulously finished Supriya's hair and makeup, and she's rocking the most elegant updo under that dupatta! 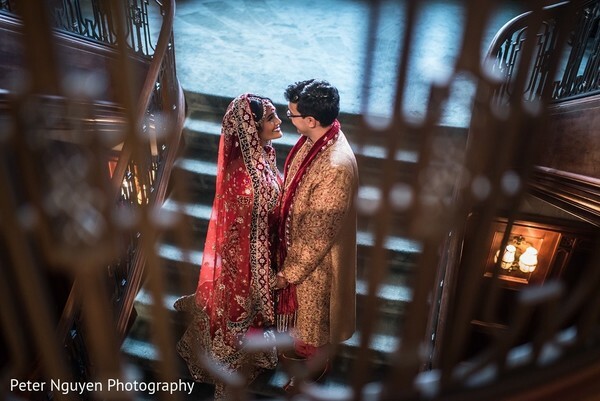 When I get back, we'll head over to Le Bam Studio for a reception to remember with the newlyweds, but before we dive into all those spectacular post-ceremony highlights, make sure to check out the rest of Supriya and Raj's first look and wedding moments in the complete gallery! 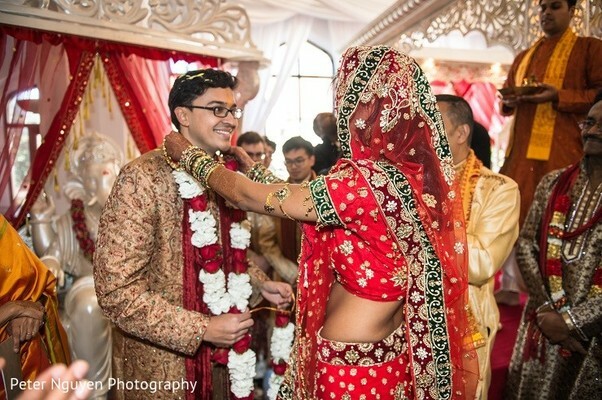 "Raj and I met on August 14, 2013, at a cafe in Storrs, CT. I most vividly remember his confident stride as he reached out for a warm handshake, while Raj teases me about how I frantically fumble with my phone as I stood up to greet him. 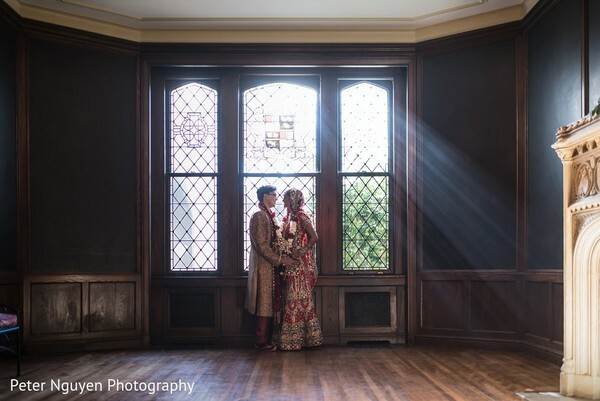 After making it past the initial get to know you's, Raj swept me off my feet with fun and thoughtful dates. We attended an Asian street festival, saw movies together, watched a fashion show, and even went on a food tour in New York City - all within our first month of courtship! The ensuing months brought even more adventure with weekend getaways to nearby cities such as Newport, NYC, and Boston. We attended numerous events, programs, and of course, movies together. Our most notable moment as a couple began with Raj visiting my hometown of Athens, GA for the first time in July 2014 to meet my parents. During this special trip, he nervously professed his intentions to marry me. With my parents’ blessings in tow, Raj proceeded to propose by the fireplace of our home on December 1, 2014, in front of our freshly adorned Christmas tree. 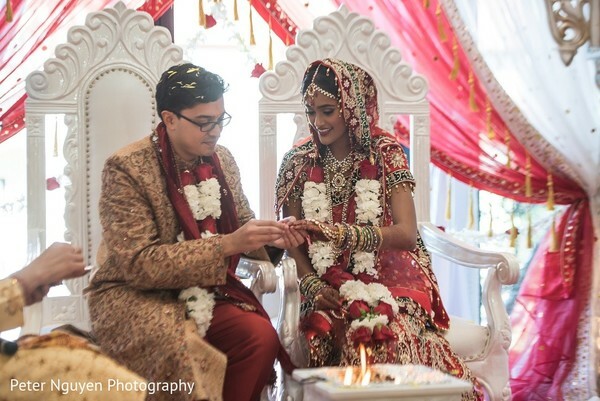 With Raj working fulltime and doing a part-time Master’s degree and me in the midst of my doctorate, we had as little involvement in wedding planning as possible. 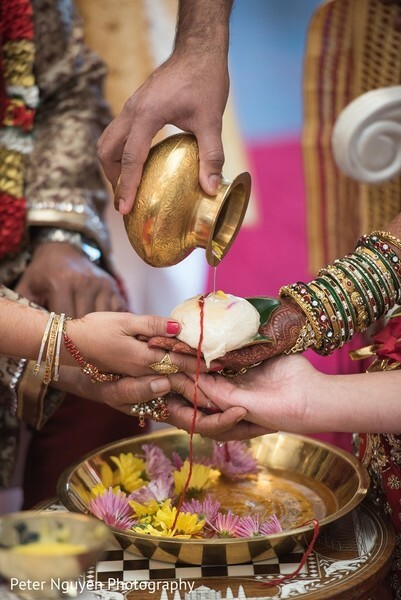 We knew we wanted a traditional Hindu ceremony with nods to Raj’s Maharashtrian culture. 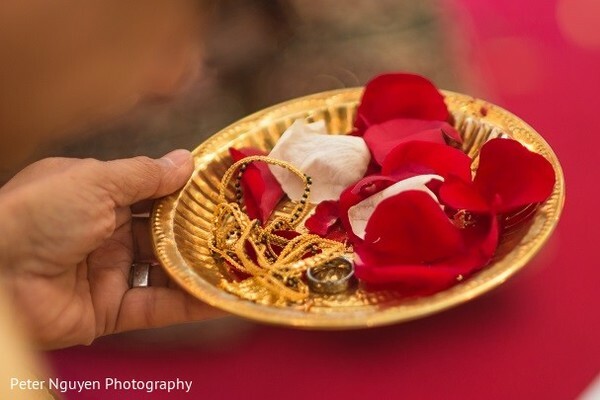 We chose red and gold as our wedding colors because they are our favorites. Since Raj and I live 1000 miles from where we got married, my parents made all the major decisions, including choosing our outfits. Raj had a blast sorting through music for the reception, while I thoroughly enjoyed taste testing all the food. On our wedding day, we were both blown away by how many of our friends and relatives came from far away to be there for us. We had guests travel from across the country (California, Oregon, and Texas) and even across the world, with people flying in from India and China!" 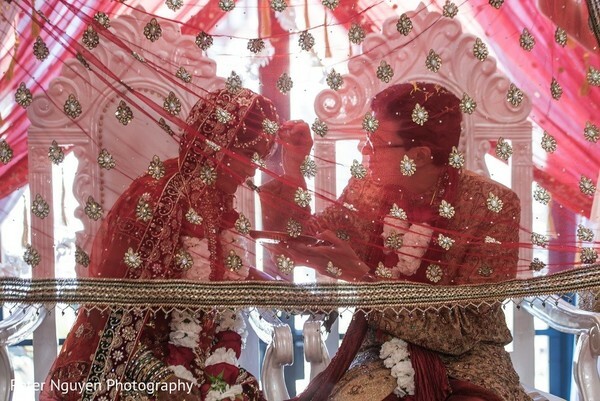 Stay tuned for much more from this sensational shaadi! 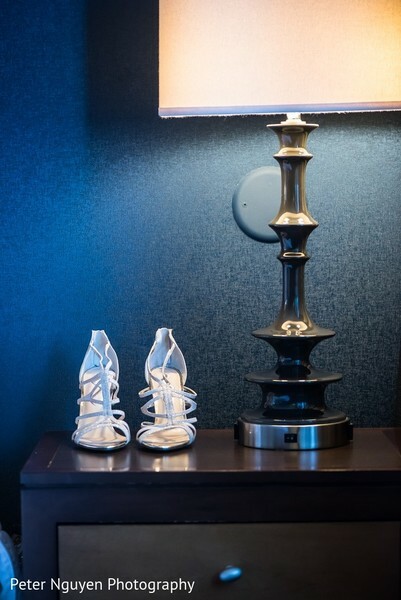 Peter Nguyen Studio is a member of the Platinum Guide. Love what you see? Explore their portfolios.